One does get the impression that Manfred Lee and Frederic Dannay did not much care for the detectives they created as Ellery Queen and Barnaby Ross. 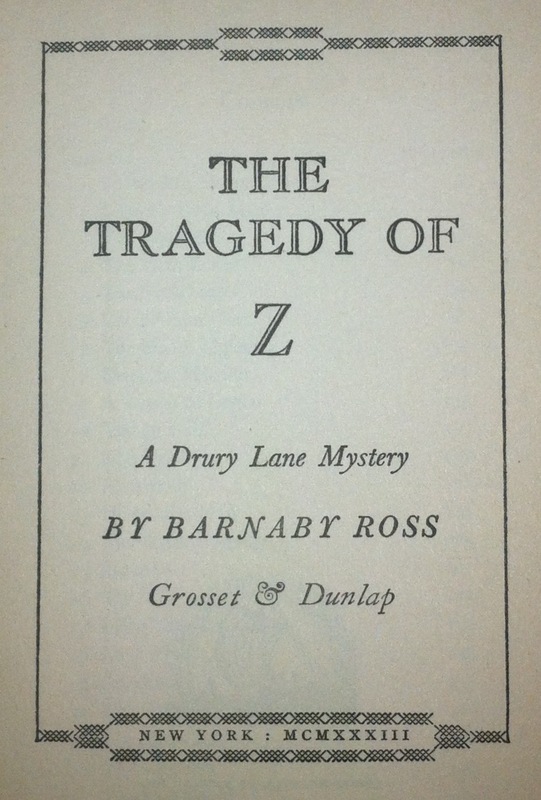 Here we are at the third Drury Lane book, The Tragedy of Z, and Drury Lane has been tossed into the dreary street, so to speak, in favor of Inspector Thumm’s heretofore unknown daughter, Patience. A dilettante to out-dilettante all competing wild youths, Pat Thumm is well-educated, but hides behind a mask of feminine coyness, and for good reason. Any time she verbally describes how two plus two equals four, the male detectives all gasp at her unexpected, for a woman, intelligence. To a 21st century consumer of mystery fiction, quite used to, say, Helen Mirren in the Prime Suspect series, the repetitive series of gasps becomes tedious pretty much immediately. In 1933, though, the concept that women were thinking human beings was, for some in the publishing business, a curious concept, and one the cousins surely hoped would attract attention to their mysteries. A woman narrator and detective would perhaps boost sales, since, apparently, an aging Shakespearean actor could not hold together the center of a mystery series. They were also jumping onto a popular trend. 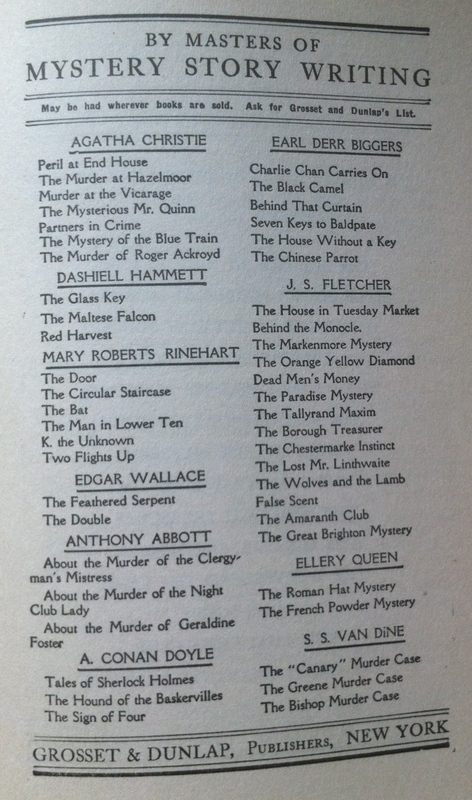 Other authors were introducing more intriguing female detectives, most notably Agatha Christie with Tuppence Beresford (1923) and Jane Marple (1926), Dorothy L. Sayers with Harriet Vane (1930), and Dashiell Hammett’s Nora Charles (1934). 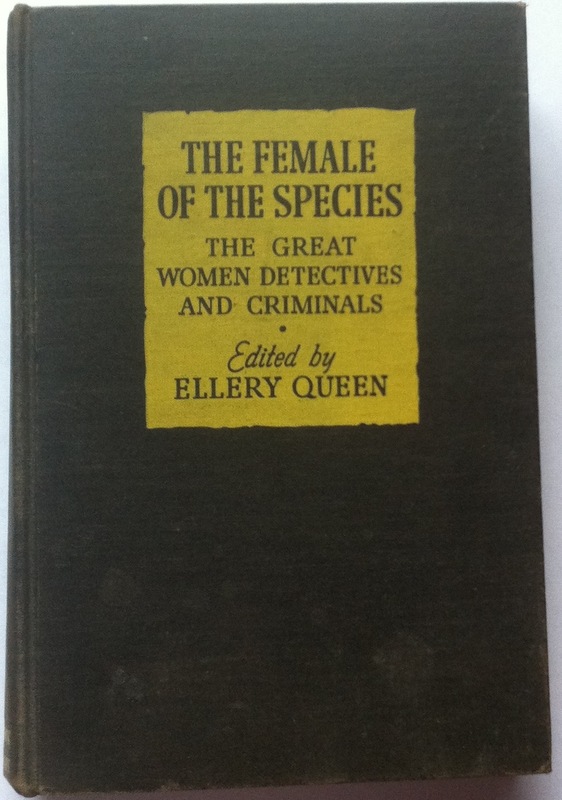 In fact, there were so many female detectives introduced in this period that in 1943, the cousins published the anthology, The Female of the Species: The Great Women Detectives and Criminals. Alas, Patience Thumm was not included. This was also the cousins’ first serious foray out of the sphere of New York City. Sure, they escaped to Long Island and Appalachia in The Egyptian Cross Mystery, but here Inspector Thumm, Patience, and Drury Lane were out of their usual environs, faced with local small town politics and interconnections alien to the usual haunts. In a few years, Ellery Queen would discover the similar village of Wrightsville, and would take frequent trips there. For now, the cousins were, perhaps, returning to Elmira, the town of Fred Dannay’s youth (yes, he was born in Brooklyn, [Brownsville, to be more specific], but soon moved upstate), for some creative fresh air. Dannay’s best friend in Elmira was named Ellery, and Elmira’s nickname is “the Queen City.” When Dannay was growing up there, Elmira was a vibrant and growing commercial and transportation center, with a rapidly growing population, moving from 37,000 in 1910 to 45,000 in 1920. Elmira is not the actual place in The Tragedy of Z: The novel takes place not too far from Albany, in the working class town of Leeds, which draws most of its income from quarrying and by housing a large prison. Of course, the Lane and the Thumms do not actually hang out with the working class. No, their concerns are primarily with the quarry owners, politicians, and the clergy. I only recently read this one after picking up copies of the 3 Drury Lanes on Abebooks. Nevins complains that Patience is kind of like Ellery in drag, and that there are flaws with the villain’s main scheme. But that final scene, literally in the shadow of the electric chair –! Perfect for a born-and-bred actor/detective, no? Patience does come up with good reasoning from the clues. Maybe the cousins wanted to use them in a new Ellery story, and decided to try for the “female detective” sub-genre?